This recipe might be more apt for pregnant women and children as it is rich in nutrients like iron, folic acid and vitamin A from the spinach, fibre, and protein from the sprouts and oats. It would be a very healthy snack option. 1. Combine the oats, urad dal, green chilli paste, salt, spinach purée and 1½ cups of water in a bowl and mix well till no lumps remain. Cover and keep aside for 15 minutes. 2. Heat a mini uttapa pan and grease it lightly using ¼ tsp of oil. 3. 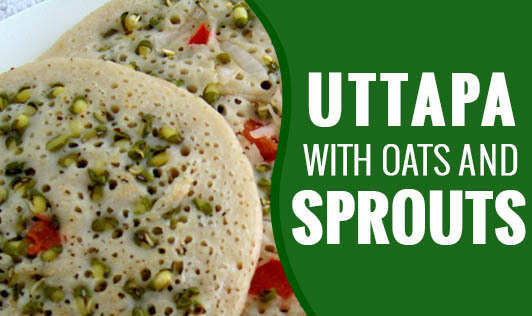 Pour a spoonful of the batter in each uttapa mould to make a 3" diameter round. 4. Top all the uttapas of the 1st batch using 2 tbsp of onions and ¼ cup of mixed sprouts. 5. Cook them, using 1 tsp of oil, till they turn golden brown in colour from both the sides. 6. Remove from the tava (griddle) and sprinkle a little chaat masala over each mini uttapa. 7. Repeat with the remaining batter to 14 make more mini uttapas in 2 more batches. 8. Serve hot with coconut chutney and sambhar.